And just like that, Cal track and field’s time competing at Edwards Stadium in 2018 is over. The Bears dominated across the board at the Brutus Hamilton Challenge, notching a dominating 15 first-place finishes. The most exciting part of the day, however, was sending off Cal’s seniors in the last home meet of their academic careers. “There’s a lot of crying, on everybody’s part to be honest with you,” said Cal head coach Tony Sandoval. “You don’t spend four or five years with people every day during their college years and not have the close bonds that you have. I don’t think there’s anything there in the academic environment that can rival the coach-athlete relationship and the team unity that happens. Senior Garrett Corcoran definitely wanted to go out with a bang, vying for a sub-four-minute mark in the mile event. Corcoran obliterated the field, running near-perfect 60 second splits each lap. Unfortunately for the Bear, he came just short, running a heartbreaking 4:00.83. Joining Corcoran with some of their own impressive performances, senior Destiny Parker and graduate student Amarie Bremel propelled the women’s throws with second-place performances in the shot put and discus, respectively. Freshman Camryn Rogers also placed second in the hammer with a throw of 65.61, breaking her own school record of 65.28 in the process. On the men’s side, sophomore McKay Johnson swept the shot and discus with two first-place finishes to continue his impressive season. 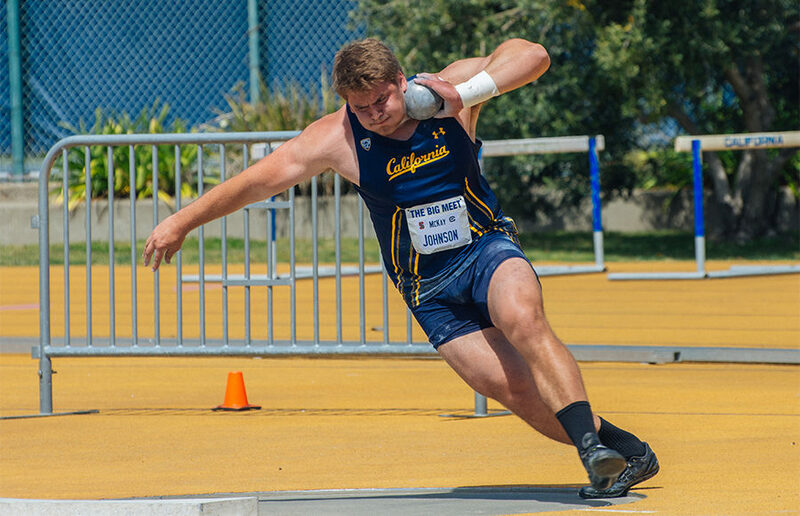 Behind Johnson, senior Peter Simon placed second in the shot, setting a season-best with a throw of 19.35 meters. “The throws dominate as always — there isn’t really anybody to compete with them,” Sandoval said. On the track side, freshman Brie Oakley turned in a huge performance in the 1500 meters. The cross country Pac-12 Freshman of the Year ran a strong 4:26.80, never once relinquishing the lead. Behind her, freshman Annie Boos came in third, notching a time 4:29.39. 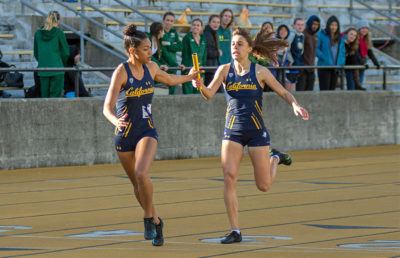 The jumpers capped off the Bears’ dominance, winning both the long jump and triple jump on the men’s and women’s sides. Redshirt junior Isabella Marten shined once again, winning both events for the Bears while senior Ashley Anderson took second in the triple jump. The Bears have two more regular season meets left in their season, with the Payton Jordan Invitational and Sacramento State Open coming up. However, Cal will be sending a limited number of athletes to each meet, if any. The combined events for the Pac-12 Championships kick off this weekend, while the rest of the team’s events will take place May 12-13.